Create this rustic chic look for your own dining room. Key elements from the Brown Estate's Napa tasting room can be found at Restoration Hardware. There’s a certain similarity about most winery tasting rooms. There’s a tasting bar, bottles of wine waiting to be taken home and hopefully a picturesque view. Few tasting rooms are sources of design inspiration, but Brown Estate in the remote section of Napa called Chiles Valley, is a striking exception. Before my visit, I admired the winery for their elegant cabernet sauvignons and juicy zinfandels that don’t knock you out with the first sip. But now I’m loving the design savvy of Coral Brown, who’s also the family-owned estate’s wine educator. The subterranean tasting room is done in luxurious and soothing shades of brown. Each detail in the cozy retreat could easily be found in the lobby of a boutique hotel. If you want to incorporate this look into your own dining room or parlor you’re in luck, as many of the key pieces can be found at Restoration Hardware. The tasting bar here was an elevated concrete topped table with convenient purse hooks. 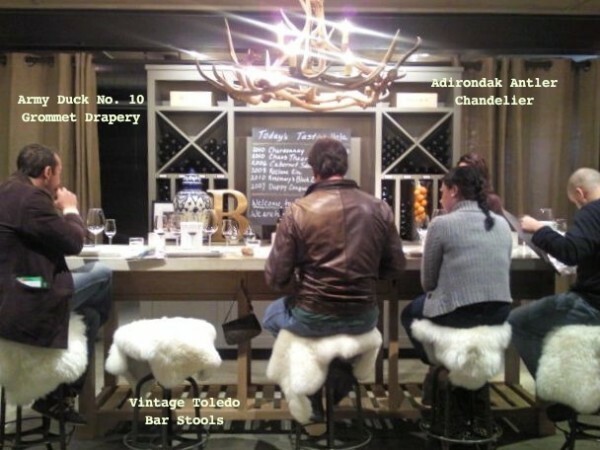 We sat on metal Vintage Toledo Bar Stools, topped with fluffy free-form lamb throws, kind of like those flokati rugs. A massive armoire filled with wine and decorated with objÃ©ts like an overside letter B, a Chinese ginger jar and chalkboard with the day’s tasting selections dominated the area. But the most striking feature of this area is the Adirondak Antler 6-Arm Chandelier, which is crafted from resin. A barrel pendant lamp casts a soft glow over a high table ringed by armless leather counter chairs draped in warm faux fur throws. Soft lighting from a Barrel Shade Pendant light and the ring of Army Duck No. 10 Grommet Drapery created a cozy place for tasting wines along with perfectly-paired cheeses. 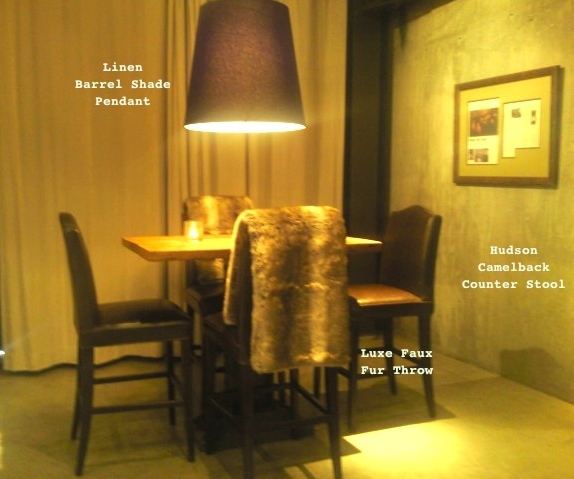 Another elevated table is ringed by Hudson Camelback Leather Counter Stools draped in Luxe Faux Fur Throws.